A great story for a winter read-aloud with younger kids, this rhyming tale encompasses many old-fashioned winter activities, while avoiding holiday themes. 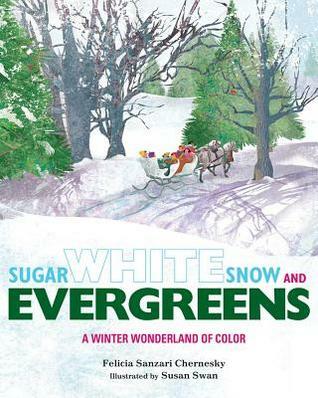 The focus is on the concept of colors, but the story goes well beyond this basic skill.Written by Felicia Sanzari Chernesky, and illustrated by Susan Swan, this picture book describes one family's winter-day activities. I've read this 2014 book today, during the first 2017 winter snowfall in my area, as a welcome-to-winter read. This could be a fun read-aloud for Pre-K through Second Grade, or for parents or grandparents who enjoy telling kiddos about activities of "yesteryear." With a combination of simple rhyming text and colorful, detailed illustrations, this story is engaging and has an energetic feel. New concepts for kids might include sleigh-rides and maple-sugaring. Most pages highlight a color word as part of the story, which is nice for the participation of the youngest audiences, such as:"A snowman pointed out the wayand what do you suppose?A plump red cardinal landed onhis orange carrot nose! "Color words are printed in the appropriate color, among the rest of the black print. The illustrations are very engaging, with lots happening on each page. Some diversity is used in the depictions of children. There are many nature scenes and animals, and a feeling of joy and excitement as the family members enjoy their very full winter day. The method of illustration is not explained on the title page (as with some children's books), but pictures have a brightly-colored look that imitates collage art, with depth and texture. Art teachers could incorporate this book into a unit that features other illustrators who use collage-style art or cut-paper shapes, such as Eric Carle. After a Kindergarten read-aloud, during Center Time students could have an art station with pre-cut construction-paper shapes to create a winter scene (green triangles for evergreens, white circles to make snowmen, etc).28 pages. Recommended for children ages four to eight. Very enjoyable! A fun way to introduce your children to colors, winter and ... making maple syrup. Read this one - it's a pleasure!Ages: 2 - 6#winterLike my reviews? I also have hundreds of detailed reports that I offer too. These reports give a complete break-down of everything in the book, so you'll know just how clean it is or isn't. I also have Clean Guides (downloadable PDFs) which enable you to clean up your book before reading it! Visit my website: The Book Radar. When we think about winter, we don't often think of a colorful palette, but this book brings exactly that to a winter visit to a farm. The traditional colors of winter, with whites, icy blues, and grays and Browns are present, but they are highlighted with pops of color that really help to enliven the scenes. While the story is likely to appeal most to younger children who are learning colors, it was a fun book for us to read aloud as well. We enjoyed reading this rhyming story together. Rhyming text flows throughout this beautifully illustrated winter story. Each page neatly adds to this winter tale as the family goes maple syrup gathering. Though the story includes color words and associated brightly rendered illustrations, the colors fit neatly within the rollicking story line. This is a definite share for preschool storytime in January. The title is kind of misrepresents the topic. This is a great use of color words, it's a lovely journey through a forest. The destination is a maple tapping farm. However maple syrup season is the end of winter, moving to spring. I am still interested in reading Chernesky's other titles. Bright white snow provides the perfect backdrop for exploring colors -- as they all look so bright against the snow. The story of maple sugaring is also explored -- colors are interwoven into the text. Great for Wonderworks storytime! Great book about where maple syrup comes from. Otherwise pretty confusing text for younger kids. Beautiful Winter book of colors. Great for preschool storytime or even toddlers. Beautifully illustrated. Includes the colors of the rainbow in spite of winter. Maple syrup making days. When Blizzard Entertainment announced that the second expansion for World of Warcraft was going to be the Wrath of the Lich King, set in Northrend, a number of fans were apprehensive about the setting. Thinking of Winterspring, the one frozen northern zone in the original game, they were prepared for a long slow slog through a tedious white landscape. Instead, Blizzard delivered on a beautiful yet appropriate cornucopia of colors. Fjords, tundra lands, permafrost; a whole rich and varied continent with only one zone resorting to a non-arctic setting. This book provides such a colorful yet frozen setting, as well as an informative lesson on how maple syrup is manufactured.However, I question the author's notes. Chernesky claims to come from a land where snowfall is measured in yardsticks, which I'd buy if she was from Buffalo, New York or Stehekin, Washington or LaCrosse, Wisconsin. But Parsippany is hardly such a land. Even checking historical snowfalls back a ways to her estimated childhood, I'm not buying it. Even if she lived in the portion of the town raised up from the Newark Piedmont Basin, in the New York - New Jersey Highlands? It's not yardstick level snowfalls. I call shenanigans. This will be a great addition to our maple sugar collection. Clever to put ‘sugar’ in the title! I wonder why evergreens are emphasized in the title, though, as they are not the main attraction with tapping maple trees. Rhyming text describes the experience, although some of the phrases don’t melt off the tongue. Most four-line verses are on one double-page spread, some are expanded on two. Each verse highlights a color connected to the specific task: pulling on brown snowsuits, sturdy bubbling pan broad and black, blue tracks in the snow. The matching illustrations are predominantly of the color named, yet have lots of color and crisp texture done in collage. The illustrations are very descriptive and actually show the cold! The last page pulls most of the colors together in both the text and the illustration. The pictures remind emind me of a cross between Ezra Jack Keat’s and Lois Ehlert’s work. I love books that show books in the illustrations: this book shows two maple syrup books on the shelf! The story opens on a family of four, who—judging from a telling illustration of the breakfast table—are running low on maple syrup. The kids are hungry but Mom suggests they go on a maple hunting adventure, seeing it is maple season. So off they go in a horse-drawn sleigh from one wintry scene to the next as random colors burst forth all around them (it is a sensory book after all, full of colorful wonders at which the little ones are sure to marvel). When they reach a farmhouse in the distance, which looks too warm and cozy to be missed, they finally fill their bellies with the coveted prize—maple syrup, which flows warm and sweet on delicious looking stacks of pancakes.This was a sweet little read with quaint and fitting illustrations that were simple yet effective. Winter is also on beautiful display and we’re greeted by welcoming views of nature. Another find in an urban southern city and this one is a nice story of a family going to visit a sugar bush farm. Good illustrations and I appreciated the one of the vat of the maple syrup being boiled with the flames under the vat, sometimes I forget about the boiling process. As one reviewer said why is the emphasis on evergreen in the title? Can be used for a basic intro as to who maple syrup is produced. A book about the joys of maple syrup season and a celebration of the rainbow of colors that can be found even during the dark days of winter.The color concept portion of the book was a little forced, but I enjoyed the coverage of tapping trees for real maple syrup in a read aloud book for PreK-2. 3.75 StarsThe cover on this book doesn't do it justice. The pictures are great and I really like the story. I can't give it a 4 star because it felt like it ended apparently ..but that could just be me!! Age: Preschool-1st gradeA great I-spy book for the colors on the page paired with a really neat walk through about harvesting maple syrup. Successful and very useful for teachers, librarians, and parents. Verses follow a family as they visit a maple-sugaring farm and notice a variety of colors in their surroundings"-- Provided by publisher. Loved the colors, sleigh ride and sugar shack. I want maple syrup and pancakes, too. I loved the colorful illustrations and the family going to work on the farm. Love the colors against the textured snow! Colors in winter. Text that builds vocabulary. Perfect storytime read-aloud for winter or color themed storytimes. Colors beyond blue and red. Beautiful winter book full of colors. I adore the illustrations and the tale told in simple rhyme. The morning shy was steely gray and hungry as two bears... Beautiful illustrations and great story on the colors of Winter and the joy of collecting maple sap.